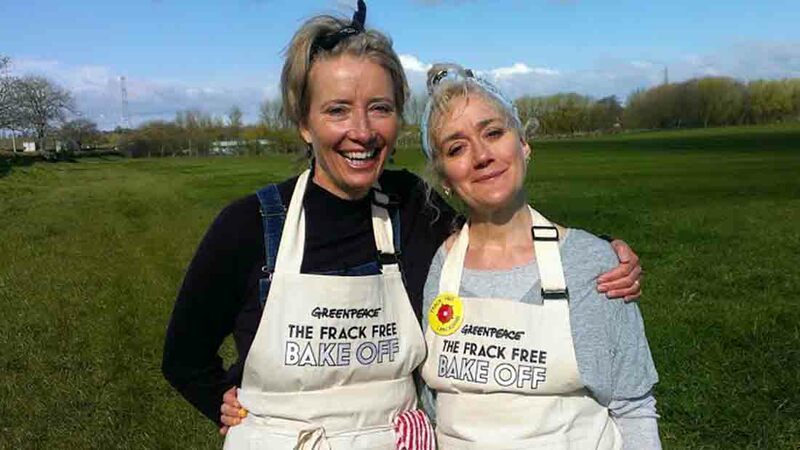 British actresses Emma and Sophie Thompson are joining anti-fracking protesters in Blackpool today for a ’Frack Free Bake Off’. Celebrity sisters, Emma and Sophie Thompson have revealed a ’cunning plan’ to stop fracking. Today (Wednesday April 27) the pair have joined Greenpeace volunteers to host a ’Frack Free Bake Off’ on the proposed fracking site on Preston New Road, Blackpool. The site, leased by fracking firm Cuadrilla, has been transformed into a film studio inspired by the popular BBC show The Great British Bake Off, where the sisters will be baking in a kitchen powered by wood and solar panels. A video was released on the Greenpeace YouTube page earlier this week, where the Thompson sisters hinted they had a 'cunning plan'. In the video, Ms Thompson said: "You may have heard David Cameron is very, very excited about something called fracking. "Now a lot of us in this country are not excited about fracking, at all. "What we are excited about is renewable energy. "After all we are living in one of the windiest countries in Europe, and are surrounded by oceans which also provide a lot of power." A designated webpage has been set up for the 'Frack Free Bake Off' which includes a quote from Emma and Sophie Thompson. "Two years ago, a group of grandmothers occupied Cuadrilla's fracking site in Lancashire. "They gave out cake and talked to people passing by about the dangers of shale gas drilling. "Inspired by what they did, we're back at the same site." The Bake Off is being filmed today and will be released tomorrow (Thursday, 28 April) at noon. The protest follows Cuadrilla’s appeal against the rejection of proposed shale gas fracturing sites in Lancashire last year. Following the rejections of the proposals from Lancashire County Council, Communities Minister Greg Clark said he would have the final decision on the Cuadrilla appeal. A message to Mr Clark on the Greenpeace website reads: "Please respect Lancashire county council's democratic right to say no to fracking. "Giving the shale gas industry permission to drill - after council leaders listened to local people and said no to fracking - would make a mockery of the government's support for local democracy."